Yelp. Don’t worry, it’s the one you’re thinking about with the stars and the ratings and dollar $igns. To increase user engagement, which includes but isn’t limited to: writing reviews and tips, checking in, bookmarking, etc. How Did They Want to Do It? Appeal more to travelers. Which kind of makes sense, but I’ll get into why that is a bit later. 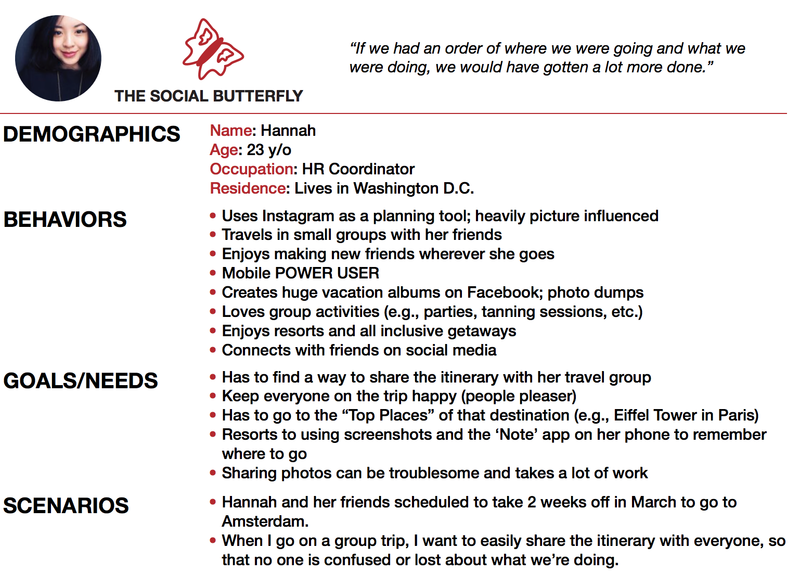 In terms of actual things, Yelp wanted a new feature to be implemented into their current system that would allow users to create an itinerary for their travels as well as keep a record of their actual experiences. 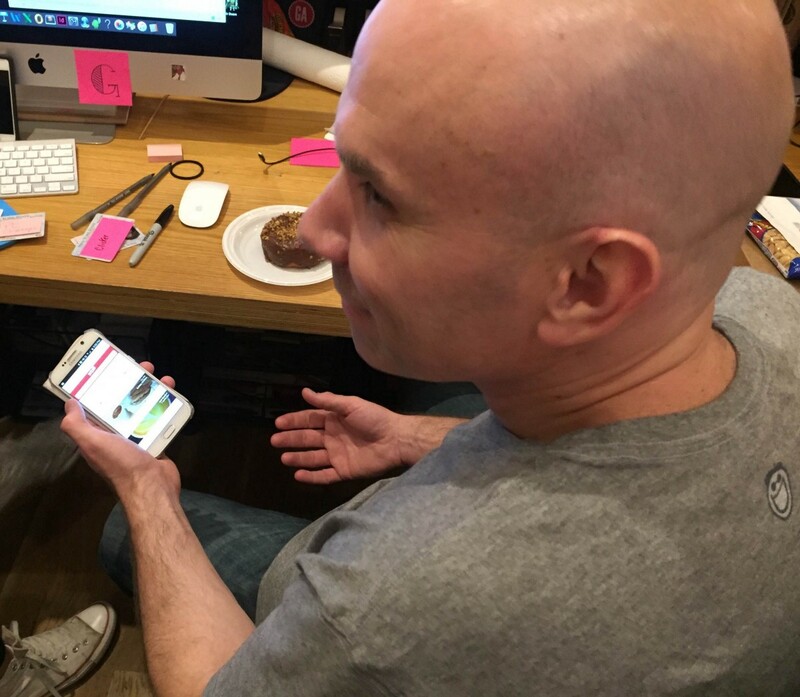 In order to really get an understanding of the task at hand, my design team and I needed to learn a bit more about who Yelp is. 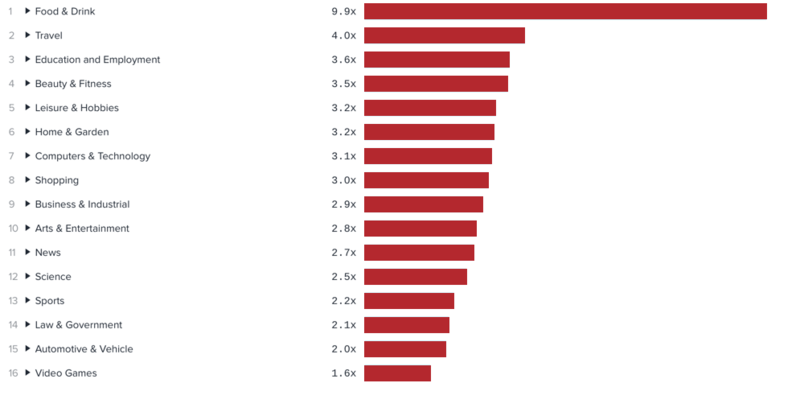 After seeing this chart (courtesy of Yelp), we were able to see why they would want to appeal more to travlers. 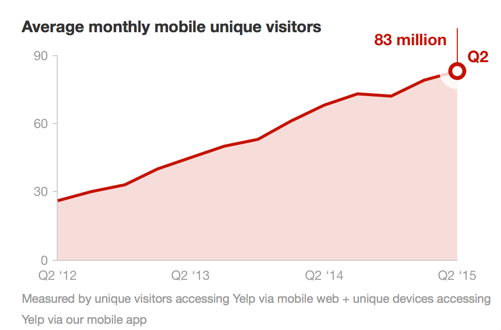 Travel ranks second in overall interest of Yelp users. But, take a look at Figure 3 below to see how it all comes together. Figure 3: Contrary to our assumptions, ‘shopping’ is the number 1 reviewed business followed closely by ‘restaurants.’ We had originally thought it would be the other way around, or at least have ‘restaurants’ in first. Travel and hotel comes in last place in terms of reviewed businesses by category. Despite its users being very much interested in travel, they aren’t using Yelp to fulfill their travel needs. My team and I saw this as the hole Yelp was asking us to fill. So, after learning about Yelp, we decided to check out the competitive landscape and so who we were up against. Figure 4: Note that all of these sites and apps, including Yelp, have a wide range of similarities and differences that don’t necessarily all apply to each competitor. It was diffcult to really hone in on what kind of competition was out there because Yelp has so many features. We decided to pick and choose other brands that were comparable to Yelp in regards to specific features. For example, Foursquare with food and ratings or Google with maps and ratings. We also took a look at TripAdvisor because they offer travel planning, which is something we took into consideration. Figure 5: All of the competitors and comparable brands varied in terms of features and functionality. It was difficult for us to prioritize which features to include. This issues was addressed later on in our design process. As you can see from Figure 5, there were a lot of things to consider when looking at Yelp’s features. There were a lot of similarities and differences between all of the brands we found that made it difficult for us to hone in one specific ones. 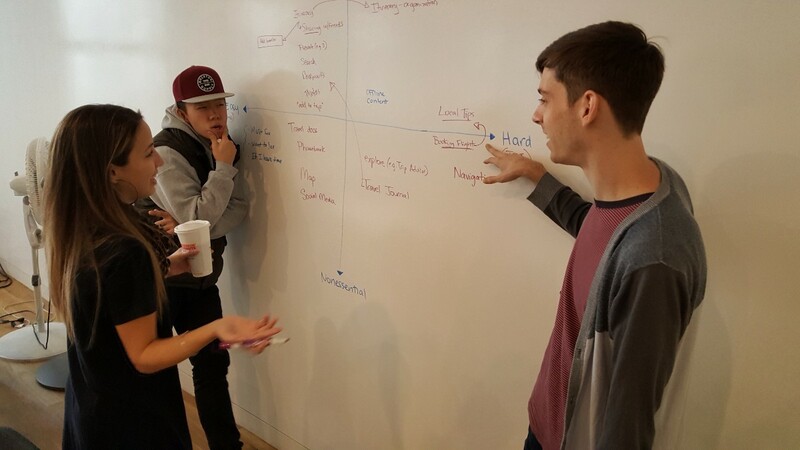 We decided to use what we had and start talking to the people who know these brands best: the people that use them. 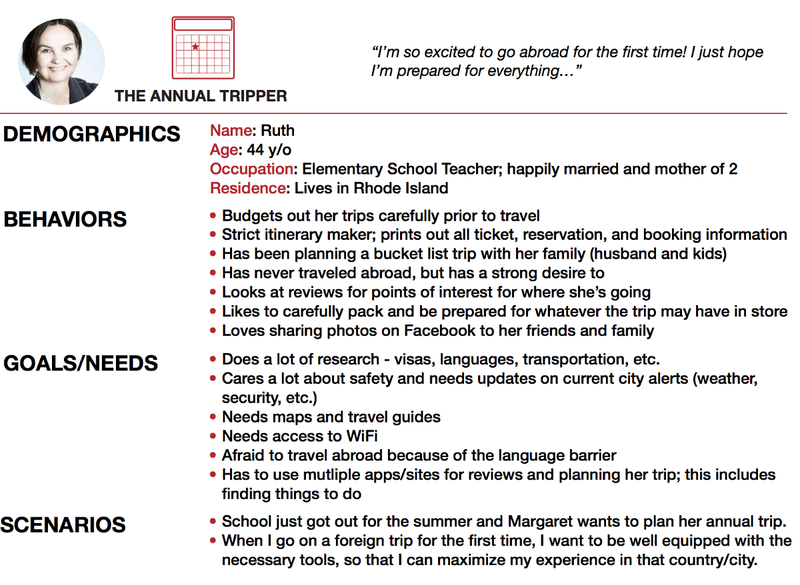 In order to figure out who to interview and how to conduct our user research, we realized that we didn’t really know how to define what being a traveler meant. Like, really meant. 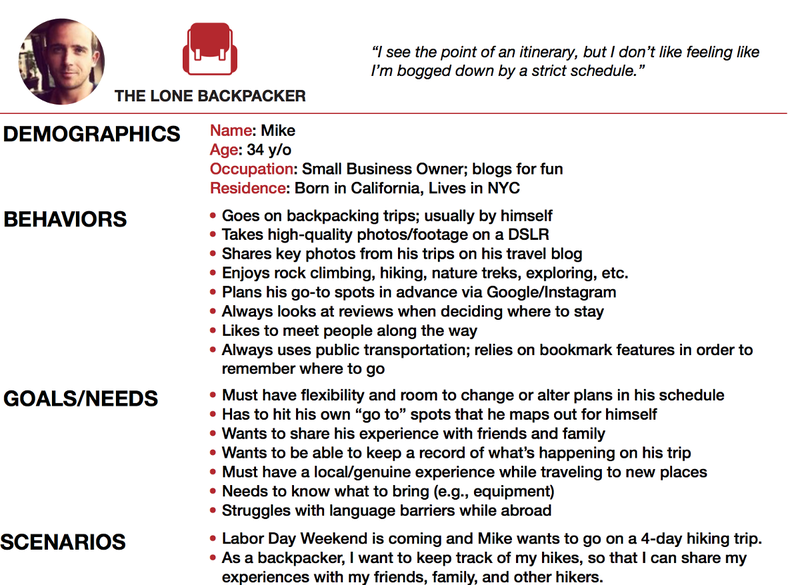 On one side of the spectrum you’ve got your adventurer backpacker. At the same time, you have your seasonal resort goer. What are the similarities and what types of behaviors do these two different people have? To get a good idea about what I mean, click our survey below and maybe we’ll shoot you and email or give you a call to see what you have to say! Figure 6: Kevin Widener (left) and Stephanie Del Rio (right) synthesizing our user findings from our interviews. After we received 110 responses to our screener survey, we did some filtering and extended an invitation for people to be interviewed. 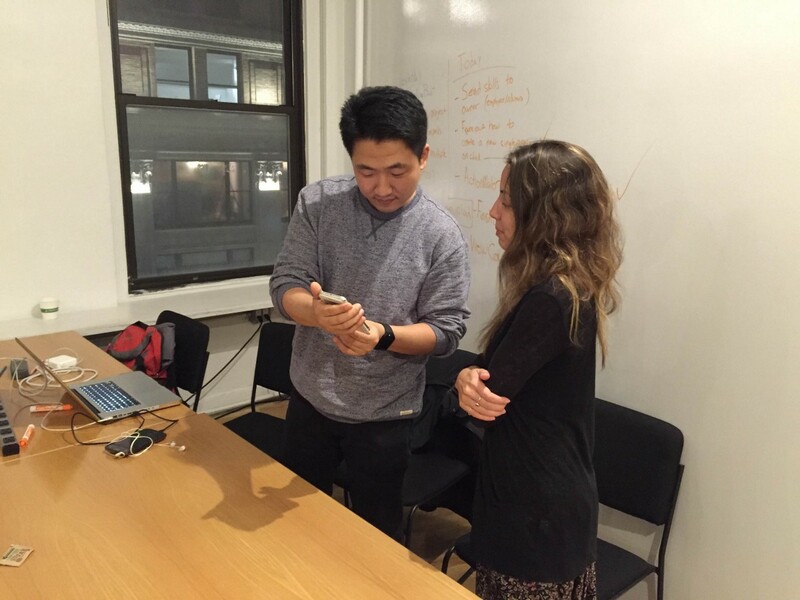 We ended up conducting 10 interviews in person and via Skype. There was a lot of great information from these interviews, but not everything was pertinent. We got a lot of feedback on preferences and opinions, but what we wanted were behaviors. People use a multitude of apps/sites when planning for travel and creating itineraries. Yelp is used primarily for quick glances at reviews/pricing of restaurants. Having flexibility is more important to someone than having a set itinerary. But, just as we had a hard time figuring out how to prioritize our competitors (see Figure 5), we realized we needed to prioritize our features, too. 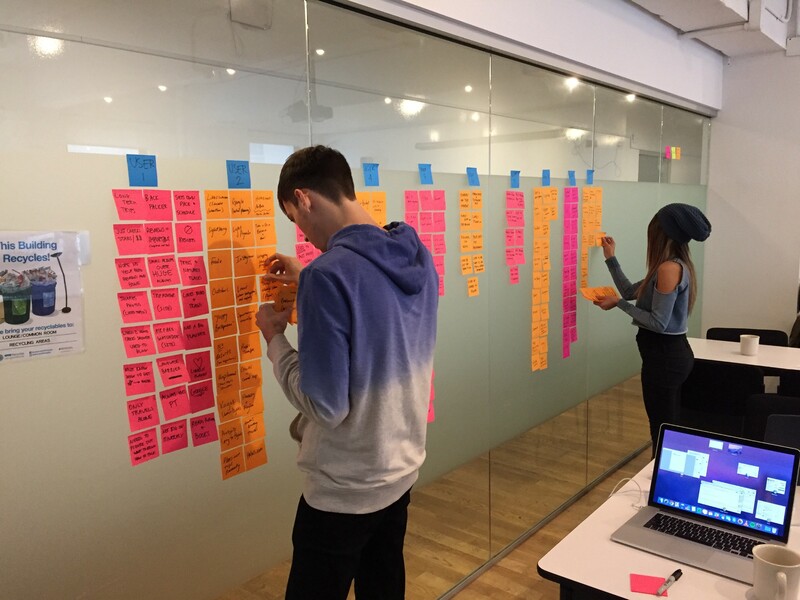 The combination of our user research findings and feature prioritization led us to the creation of our personas. Based on these personas and their goals and needs, we began our sketching. Just as we do with any of our designs, we started off sketching by hand in order to get ideas down quickly to save us time and money (just kidding, we had no money to work with, but time was of the essence!). 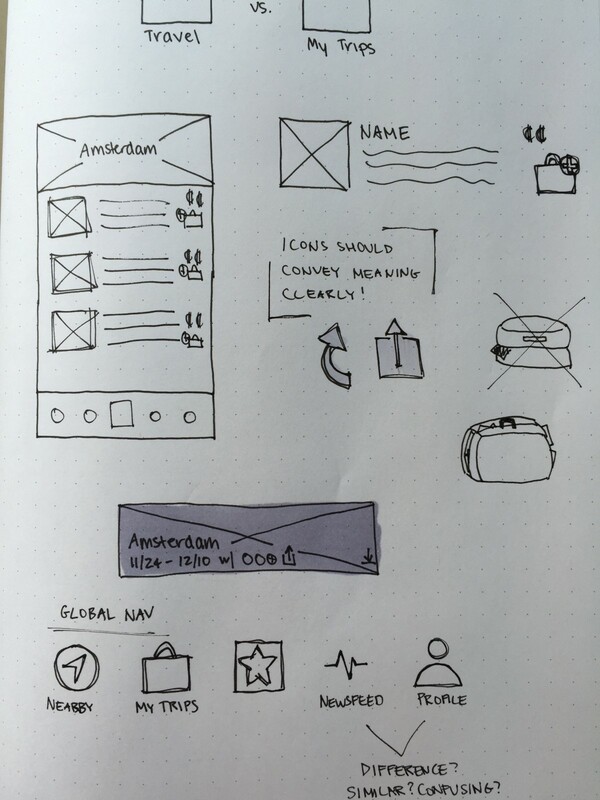 Figure 11: Quick ideas for design functions and icons on the global nav. We had a rough time getting through testing, but we knew we were getting closer and closer to a possible solution with each test. 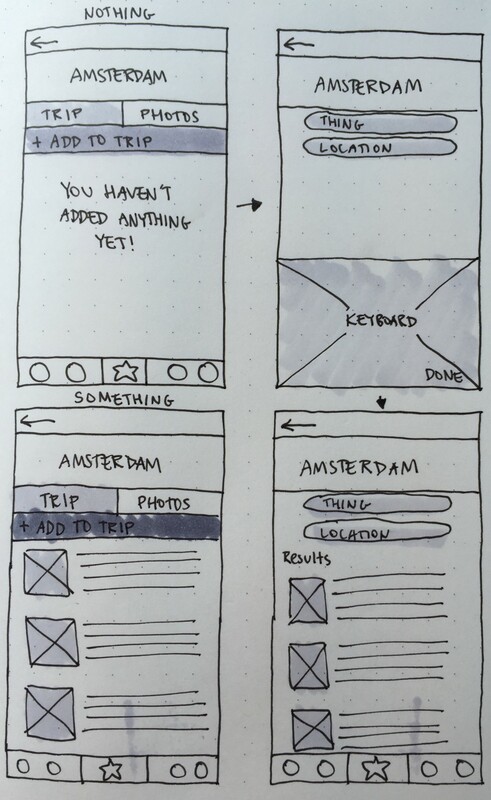 Ultimately, it led us to our first few sets of wireframes. You and your friends decided awhile ago to take the same 2-weeks off in March so you can go to Amsterdam for the very first time. But, you don’t know where to begin in terms of what to do and how to plan it. Create a trip and add something you might want to do to your itinerary so that you can view it later. 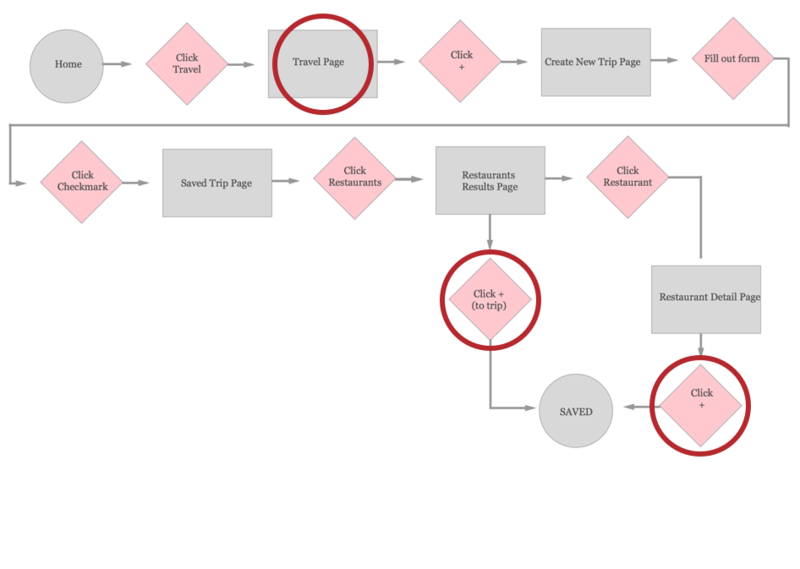 Figure 14 represents the the key screens that were created or altered in order to create our new feature into the Yelp app. From left to right you have the home screen, the ‘My Trips’ page, the search results page that contains the suitcase button, and the restaurant details page also containing the suitcase button. From these findings, we decided to implement the changes into a hi-fidelity wireframe to incorporate color and Yelp’s branding to help guide our user’s flows. After iterating through our hand drawn sketches and our medium-fidelity wireframes, we came to this final hi-fi wireframe. Feel free to click the iPhone below to test our prototype. The task given was: You are going to Amsterdam with your friends and you need to plan something to do, specifically somewhere to eat. 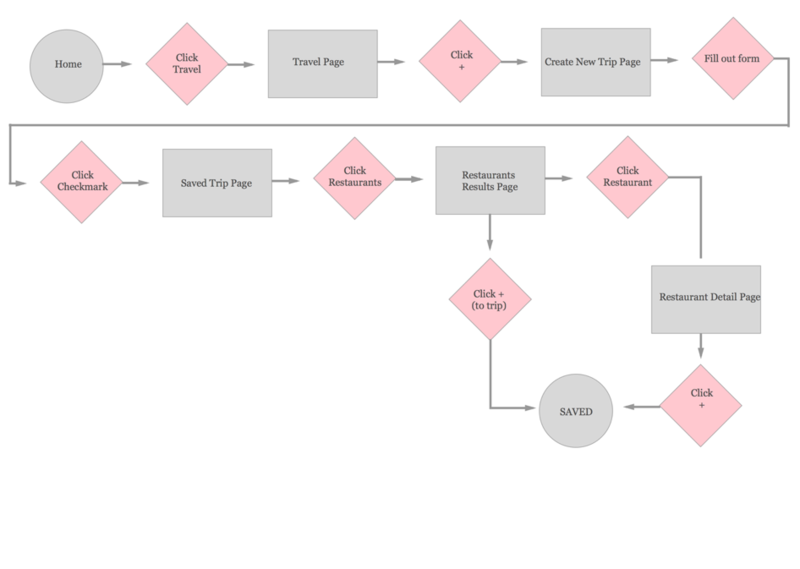 After prototyping this wireframe, we immediately ran 3 user tests. Right off the bat, all three users clicked on the ‘My Trips’ button rather than using ‘Search’, which contradicted our previous findings. We weren’t anticipating contradicting results, but it was definitely something to consider. Despite not having the time to research, test, and validate these findings, we definitely wanted to dive into it more in order to finalize the most optimal solution. As a team, we had a huge amount of next steps.